New video explains the setting and why everything has a purpose. No Man's Sky won't have a dramatic narrative told via CGI cutscenes, but it will be sprinkled with lore. 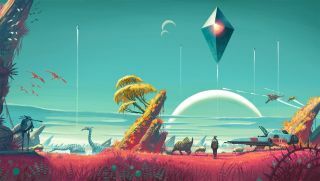 That's according to a new video, embedded above, in which Hello Games' Sean Murray explains the studio's desire to create an environment for things to happen in. To those ends, the studio recruited Dave Gibbons and James Swallow, who have worked on Watchmen and Star Trek respectively, among other things. The video is a stealthy advert for a No Man's Sky special edition featuring some comic work done by the former, but it's also a neat insight into how much work has gone into making a procedurally generated universe feel alive. No Man's Sky releases on June 21. Chris had some hands-on time with the game last month, and used the opportunity to go swimming in an acid lake.